Learn more about our arts center staff. The Eau Claire Regional Arts Council's mission is to transform people's lives through the performing and visual arts. The Eau Claire Regional Arts Center provides a home base for local arts organizations, gallery space for area artists, a 1,098-seat theatre for local and national touring shows, and countless opportunities for everyone in the Chippewa Valley to enrich their lives through the arts. Each year, over 100,000 people of all ages and backgrounds participate in arts programs at the State Theatre — as performers, artists, audience members, students, visitors, and volunteers. The Arts Center serves as a cost-effective way of enhancing the quality of life in our community and providing a downtown destination for residents and visitors alike to either enjoy a touring show or a locally produced performance at the historic State Theatre or to view an exhibit featuring local artists in the Janet Carson Gallery. It is a place as well as a purpose in which the Chippewa Valley can continue to take great pride. Eau Claire's historic State Theatre first opened as a vaudeville theatre in 1926. No expense had been spared in erecting the $315,000 (1920's dollars) Theatre, one of nearly one hundred built by the theatre enterprise of Finkelstein and Ruben in Wisconsin, Minnesota, North Dakota, and South Dakota. The Theatre was described as the "brightest gem in the glittering chain of Finkelstein and Ruben amusement palaces," according to the 1926 Eau Claire Leader. The theatre was designed to handle all attractions booked from vaudeville agencies in Chicago. Vaudeville shows were held on Friday and Saturday evenings. The first curtain rose at the State Theatre at 7 pm on January 19, 1926, and offered the audience a two-hour show, the highlight of which was a vaudeville act, "Classified," starring Corinne Griffith as Babs Comet. Theatre-goers that evening were also treated to performances by the State Concert Orchestra, Richard Bach, who offered his musical interpretation of "Movies" on the Wurlitzer organ, and 18 singers, dancers, and comedians who performed "A Syncopated Menu" Jazz Revue. Several years after opening, the State Theatre was converted to a movie house, operating for decades and bringing Chippewa Valley movie-goers major hits of the 20th century, including Jaws and Star Wars. The movie house closed in 1982, but the facility was used occasionally for community events. 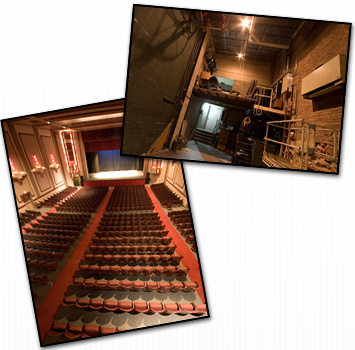 In 1984, the theatre was donated to a group of arts-minded community members who had formed the Eau Claire Regional Arts Council (ECRAC), on the condition that they restore the theatre and transform it once again into a center for artistic expression. The structure was, by now, in need of major repairs and became the focus of a community capital campaign initiated by the Arts Council. The drive was dubbed "State of the Arts," and sought to raise funds for the renovation project. "Restoring the State to an exact replica of its former self was neither possible nor desirable," according to the renovation's lead architect. "The original walls and ceiling were obscured by later renovations and pulling down that work would have been a project in itself. We're approximating what was originally built by restoring the classical style within a deco shell." Area individuals, corporations, foundations, and other organizations funded the project which refurbished 1,098-seat theatre and its adjacent offices. The newly renovated State Theatre reopened its doors in 1986 with performances of "Cinderella" by the Chippewa Valley Theatre Guild. Today, still owned and operated by ECRAC and known as the Eau Claire Regional Arts Center, the State Theatre complex provides a home base for local arts organizations, gallery space for area professional artists, a 1,098-seat theatre for regional and national touring shows, and countless opportunities for everyone in the Chippewa Valley to enrich their lives through arts.